There’s a total of 50 different provisioning ingredients in ESO, and every provisioning recipe uses between one and four ingredients. Ever since the revamp to provisioning in patch 1.6, the number of ingredients is a lot smaller, and provisioning is much more understandable and simpler as a profession. That’s still quite a lot of ingredients, especially if you’re planning on keeping all of them. Keeping all of your ingredients in the bank or inventory takes a ton of inventory space. What makes provisioning complicated as a profession, is knowing which ingredients are worth holding onto. There’s ingredients that are used solely for Food recipes and ingredients that are only used for Drink recipes. Some ingredients are used more often than others, but that doesn’t necessarily make these ingredients more valuable than the less-used ingredients. It’s good to remember that for each desired provisioning consumable effect (such as a buff to Health or a buff to Magicka and Stamina Recovery), there’s three different recipes. This also means that no single ingredient becomes much more valuable than the rest, because there’s always other options to be able to cook or brew the same product, providing that you have the recipe, of course. Getting provisioning ingredients in Elder Scrolls Online can sometimes be a bit hit-and-miss. Looting containers such as crates and baskets is often your best bet. Some ingredients are dropped by monsters and wildlife; it shouldn’t be a surprise that ‘Game’ can be looted from deer and some other huntable animals, for example. Rabbits drop ‘Small Game’, and so on. The provisioning hireling perk and provisioning crafting writs are other ways of getting your hands on the ingredients. Of course there still are provisioning ingredients in ESO that aren’t very common and are generally difficult to get your hands on – there’s two of them, one for food recipes (Frost Mirriam), and the other for drink recipes (Bervez Juice). These rare ingredients are only used in purple quality recipes that provide a buff to all three attributes. If you want to cook or brew purple-quality stuff, there’s no way around these two ingredients. 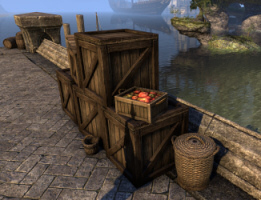 Certain ingredients can be bought from Grocer vendor NPCs, located all over Tamriel. All of these ingredients cost 150 gold each, and they are only used for food recipes. Whilst grocer NPCs are probably the best source for these ingredients, you can also find them in containers and such. Ebonheart Pact: Black-Silk-Earth in Davon’s Watch, Stonefalls. She’s at the northern part of the Market District. Aldmeri Dominion: Samardan in Vulkhel Guard, Auridon. He’s near the docks by the merchant stall. Daggerfall Covenant: Jafrost Cold-Eye in Betnikh. She’s at the Dockside Trading Stalls. Here’s the full list of provisioning ingredients in a single table, sortable by the ingredient name, recipe type, the number of recipes they are used in and the source of the ingredients. With so many different ingredients out there, it may not be feasible to keep all of them in your bank. You may have to choose between Food and Drink ingredients, since basically every ingredient is used in the full level range of recipes. Personally I prefer food over beverages because I find the flat buff to stats more useful than the recovery rates. Either way, you really want to hold on to Frost Mirriam and Bervez Juice just because of their rarity and usefulness. Every provisioning recipe requires at least a primary and a secondary ingredient. The primary ingredients are only found either in specific alliance zones, or are looted from said alliance npcs (as an example you can get Daggerfall Covenant ingredients as an Ebonheart Pact player as loot when you kill Covenant humanoid mobs and such). These alliance-specific primary ingredients are used only for lower level recipes. It seems that all level 1-35 recipes utilize alliance specific primary ingredients, whilst the recipes between level 40 and veteran rank 5 all use primary ingredients which are common for every alliance. Secondary ingredients are common for all alliances, and there’s less of them in general. On top of this, there’s ingredients for blue and purple provisioning recipes. Let’s divide these into tier 2 and tier 3 ingredients for clarity’s sake. Tier 2 ingredients are used for blue quality recipes and tier 3 ingredients are used for epic (purple) quality recipes. These ingredients are found in ALL zones, and apart from looting containers, the best way to get them is having a provisioning Hireling. Blue & Purple provisioning recipes add ingredients on top of the base recipe, empowering the original recipe. 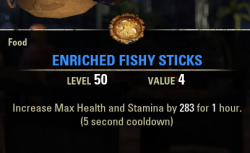 If the original food added max Magicka, a blue version of that recipe could add max Magicka and max Health, whilst the purple version would increase all max Magicka, max Health and max Stamina. The table below shows all primary provisioning ingredients. As you can see, for most of the recipe levels there’s six primary ingredients for that level, and many of the primary ingredients are alliance specific. Shornhelm Grains, for example, is a primary ingredient typically found in low level Daggerfall Covenant zones. Only Daggerfall Covenant players can find recipes which use Shornhelm Grains. You can use the recipe on another alliance, though, but it’s not very convenient. Primary ingredients are more general than secondary ingredients – Shornhelm Grains is used for beverages, which includes beer, spirits and wine recipes. It’s used in all three of the level 1 beverage recipes. This applies to all the other primary ingredients as well. With that in mind, you’re safe to throw away the lower level primary ingredients once you no longer think they are useful for you. This table shows all the secondary provisioning ingredients, their recipe level, type of consumable they are used for and the base consumable effect. Secondary ingredients are not alliance specific – they are common for all three alliances. Each secondary ingredient covers a range of recipe levels, and is used for very specific recipes. Drippings, for example, are used as a secondary ingredient for level 1-15 Grilled Food recipes, and the base consumable effect of these recipes increases max Stamina. Beverages increase stat recovery rates. If you don’t find beverages useful, you can just outright ignore grapes, malt and mash, for example. Once you’re in the veteran ranks, you probably don’t want to keep very low level ingredients in your bank either. Secondary provisioning ingredients are obtained from containers, as loot and from hirelings, but they can also be bought from Grocers. Grocer NPCs who sell level 50+ provisioning ingredients are located in Veteran Rank zones. An Aldmeri Dominion player would have to go to the Ebonheart Pact or Daggerfall Covenant zones and so on. Tier 2 Ingredients are only needed for blue (and purple) quality provisioning recipes. Depending on the type of consumable, the blue recipe adds an ingredient on top of the primary and secondary ingredients, meaning every blue recipe will require a primary ingredient, a secondary ingredient and the tier 2 ingredient. Tier 2 ingredients are needed for all blue recipes between levels 10 and VR5. Blue recipes get a new prefix: ‘Enriched’, ‘Fortified’ and ‘Invigorated’, and the recipe will add an extra stat/effect on top of the base recipe. Tier 3 Provisioning ingredients are only needed for purple (epic) quality recipes. The final consumable will increase all three stats or recovery rates, and the tier 3 recipe names have the prefix ‘Consummate’. Tier 3 provisioning ingredients are needed for all purple recipes between levels 35 and VR5. Note that every tier 3 recipe of a specific type requires both of the ingredients. That’s why I’ve listed garlic & pepper on the same row – you never use them separately. They are ONLY used together and for tier 3 recipes. A tier 3 / epic provisioning recipe will always require the primary ingredient, secondary ingredient, tier 2 (blue) ingredient and the two tier 3 (epic) ingredients, meaning you always need five ingredients for a tier 3 recipe.